I feel like I've been leaving everyone hanging and I'm sorry about that. I have a very bad, really annoying habit of getting caught up in the daily stresses and going 150mph at all times…that I forget to breathe and just enjoy now. I hope to get better about that in 2014. 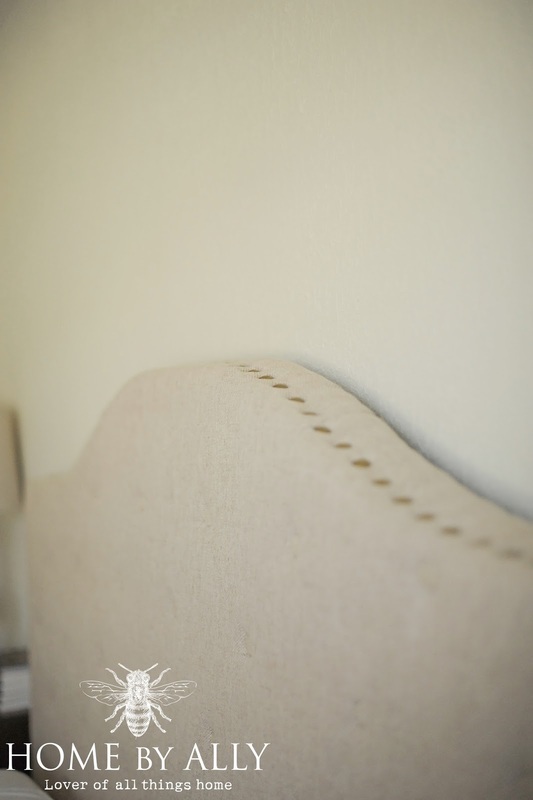 For now, I wanted to share with you a peek at our new headboard. 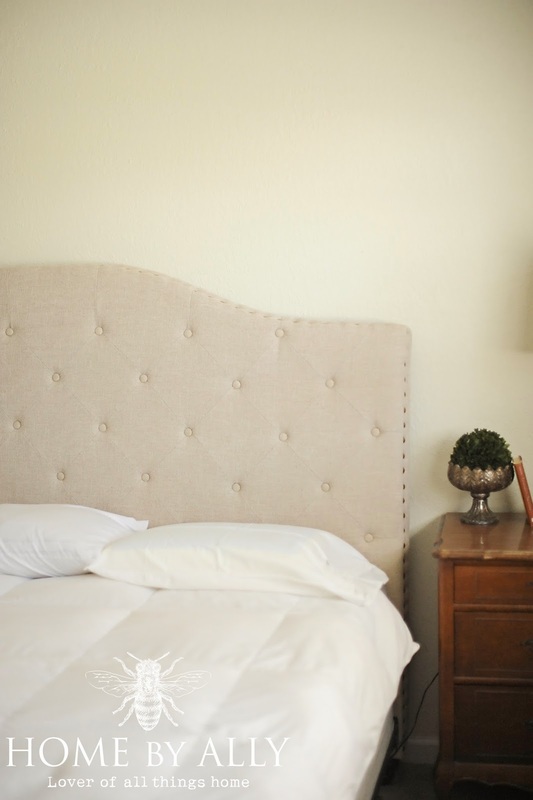 As many of you know, at one time for our guest bedroom, I made a DIY nailhead trim Pottery Barn inspired headboard for our old guest bedroom. You can find out how I did that by clicking here. In our new home, very soon after we purchased it, we opted to purchase a temperpedic mattress set in king size. We used to have a queen and I will never go back! 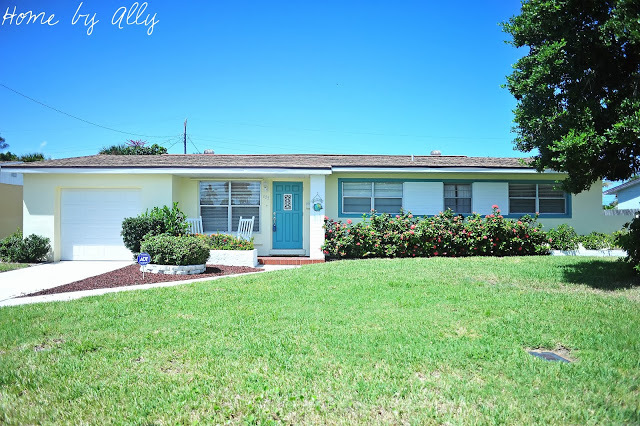 So long story short, we sold our old bedroom set and I've been slowly putting together on a budget our new bedroom including finding a new headboard vs. making one. 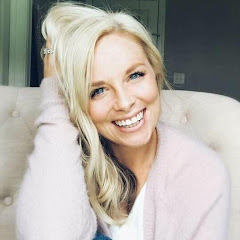 After doing the math for supplies, labor & materials, it came out cheaper and easier to just purchase this headboard from Kirklands that you can find here. 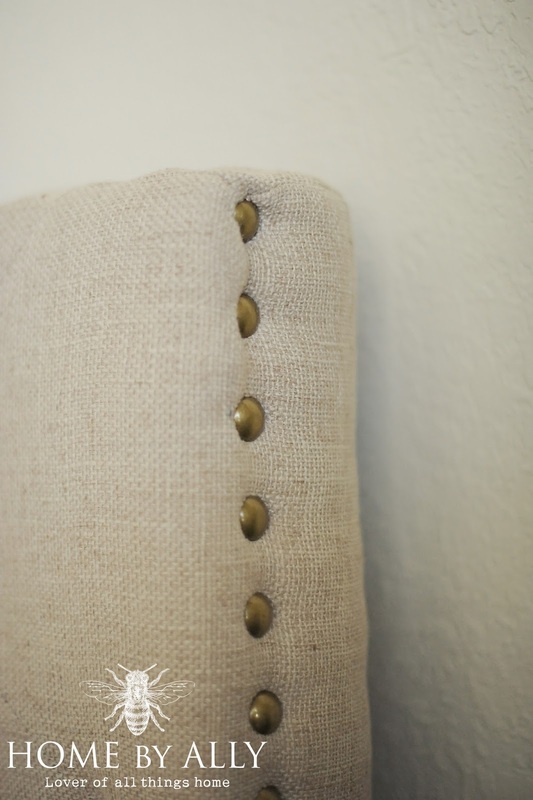 It has nailhead trim on the sides and top which I feel doesn't take away from the tufting that I wanted as well. The material is a nice, neutral linen colored twill. I waited until Kirklands had a decent sale and matched that with free shipping to our local store which equalled out to me saving about $100. Perfect! Here's abetter shot. We have two matching side tables, one on each side of the bed for the husband and I. I found them at a garage sale and I practically stole them. I even got money off the price because I was from North Carolina and the guy loved my accent. Uh huh ;-) I love the shape, the price was more than right and they have the potential to be painted although I'm not sure if I will yet. More shots of the headboard. I have a few options from previous purchases for above the headboard. Pretty sure we will be doing a mirror but can't make any promises. 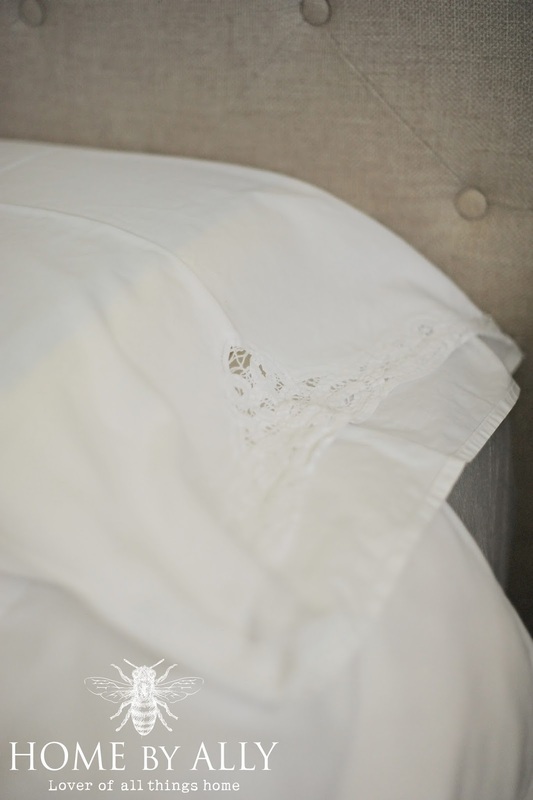 I love the subtle beauty of this headboard. 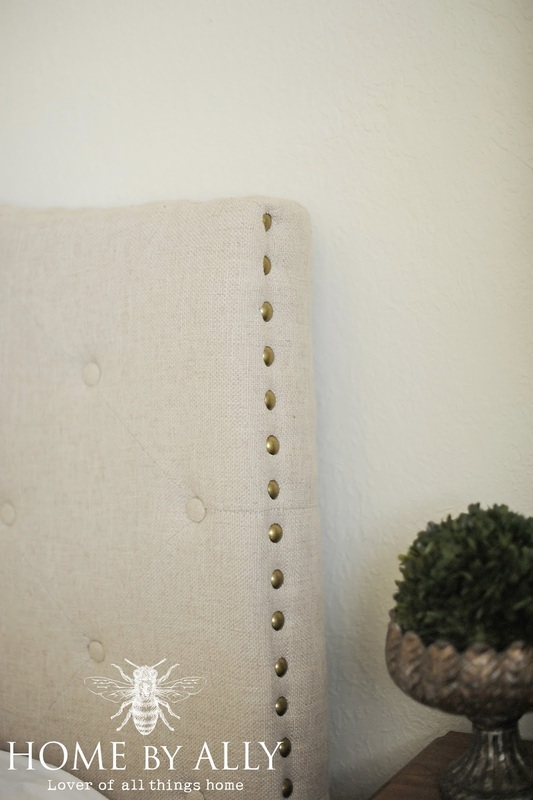 With classic lines, tufted headboard and finished off with nailhead trim…and I forgot to take photos of the cute feet that it comes with. I bought this bowl? at the antique mall awhile ago from a vendors booth that I frequent. It's perfect for one of my boxwood balls! And I also have books on my end table… lots of books. I did take the Hunger Games books out of the picture because I didn't want to be a dork! But at least I told you anyways! ;-) Hehe! The book I have below was a wonderful gift, a book of quotes. And from the same vendor are these vintage pillow cases. They are so delicate and pretty. Now that inspiration has really struck, I have started to browse for a new light fixture, a nice comforter or quilt and some accessories. I also picked up a large and long french provincial style dresser that mimics the lines of our side tables. I paid $100 for it but sold a few things to make it FREE. Let me know what y'all think of the new headboard and if you love it. If you don't…well… don't tell me. Oh! And before I forget! Exciting news so I'll get right to it! Sadly, Dawn and I are both leaving Wildwood Antique Mall for a new adventure with our friend Heather, from Pinneapple Avenue! 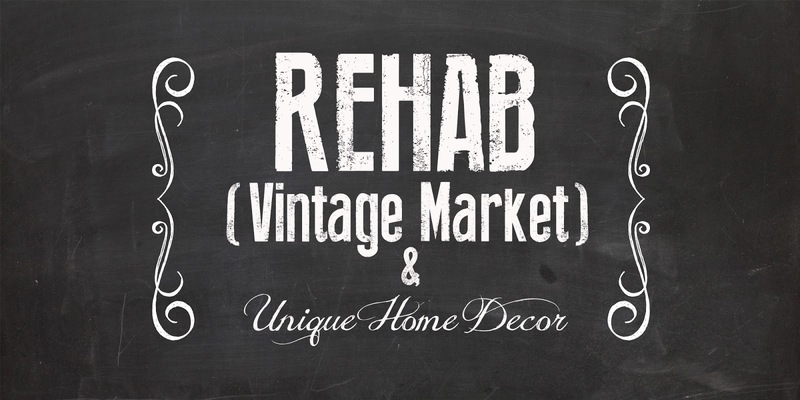 Heather is opening her own shop called "Rehab- Vintage Market & Unique Home Decor" and we will be located in her shop beginning next month! Here's a peek at her new logo that I had the privilege of making! I can't wait to show y'all progress of our space and hopefully you can come visit too! About the bowl, it’s vintage and unique, seems like it was molded from ancient country! 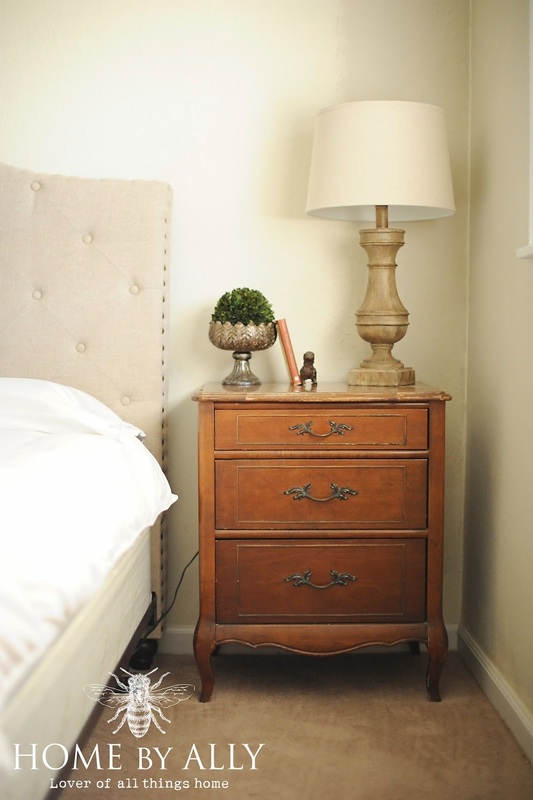 I adored the cabinet most, the lamps and the bed. Too cozy, too elegant and fascinating to look at. Clever! your headboard is gorgeous. great job. i love the end tables and am hunting for similar for my spare room to leave unpainted. Oh, I love your headboard! Your tables and vintage bowl are gorgeous too! A wide range of scents will work, says Bechen, even some you wouldn’t expect: If the smell of coconut and pineapple brings back memories of a mellow, sun-drenched vacation in the tropics, that fragrance may bring you a sense of calm and warmth. ...Really this post is valuable for us.